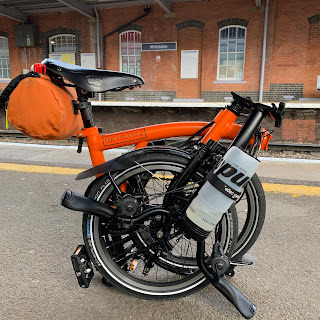 My Orange Brompton: The best waterproof cycling backpack? If you have read my blog you will know that I am an all season, all weather Brompton cyclist. I rarely let the rain stop any cycling trips and regardless of what is going on outside my front door I commute to work in everything bar snow, heavy ice or heavy fog. I have a number of luggage options including the Brompton C and S bag as well as the Carradice Roll Saddle bag. I have been thinking about a cycling backpack for ages and after extensive research, I am pretty certain I've found near perfection. 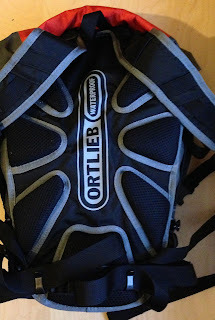 The backpack in question is the 'Airflex 11' by Ortlieb. 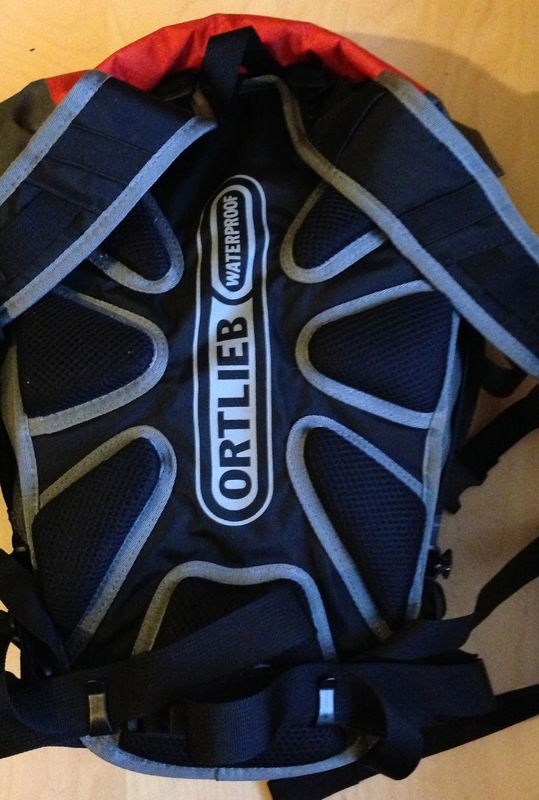 For those who have not heard of the company Ortlieb they are a German manufacturer who make lots of different types of bags and travel systems specifically for cycling. They even make a few bags especially for Brompton - the Mini O and the larger Brompton Ortlieb Bag. When their bags say that they are waterproof they really do mean waterproof. (More on that later). 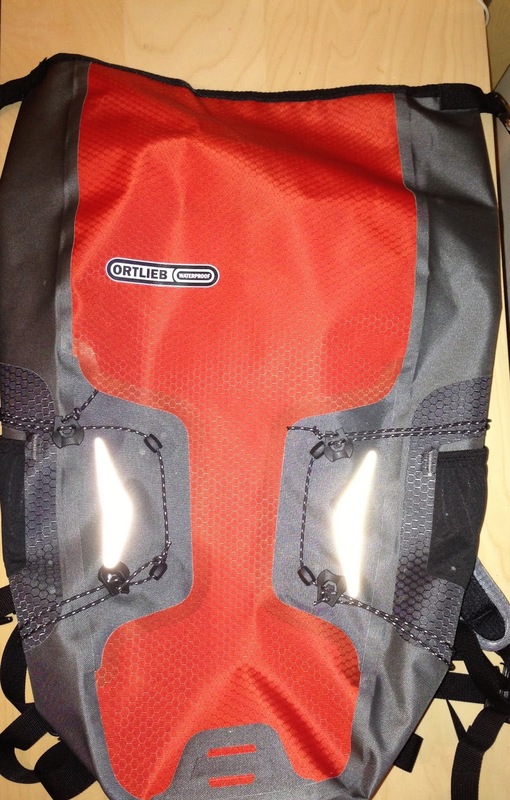 The Airflex 11 is a very good looking backpack but it isn't just a pretty face it is built with functionality in mind. 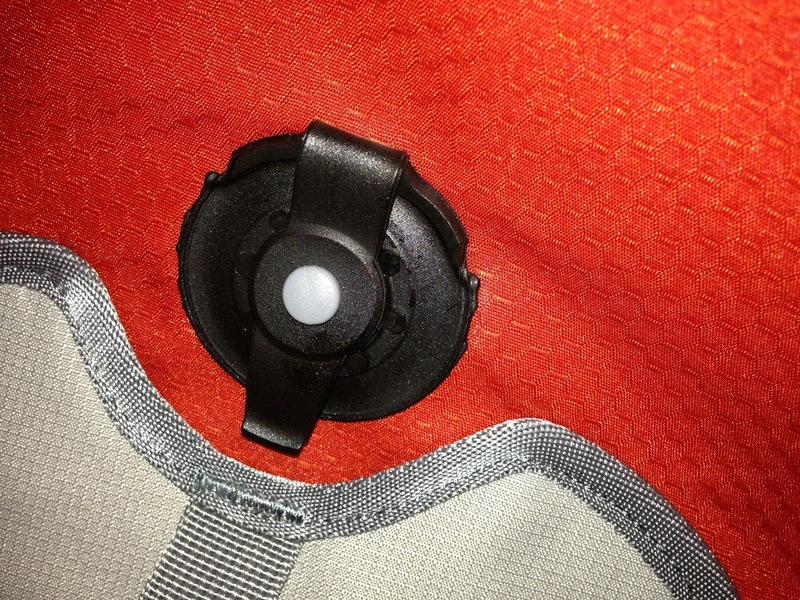 It has two reflective triangles and a loop for attaching a rear light. 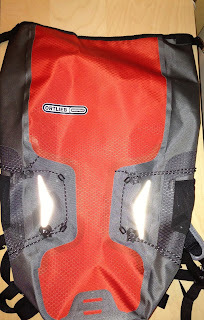 Shock cords run around the front and sides of the backpack. These are easy to adjust and are great for stowing away a jacket if there wasn't room inside. The straps are padded and very comfortable and well positioned. There is also a fully adjustable chest harness and waist belt. 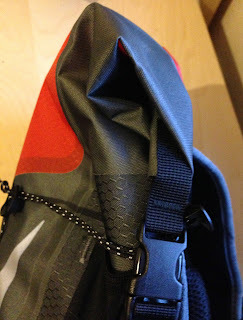 A nice touch is that the straps for these can be easily tucked out of the way if not required. 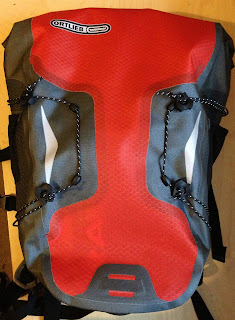 The rear of the backpack has several raised pads. These not only allow ventilation but make whatever you are carrying that bit more comfortable. The Airflex 11 has a capacity of 11 litres. It isn't a huge backpack by any means but 11 litres is more than enough for my purposes. At about 600g it is pretty lightweight. Having used this backpack for a couple of days now I can say that it is extremely comfortable and at times I have forgotten that I am wearing it. 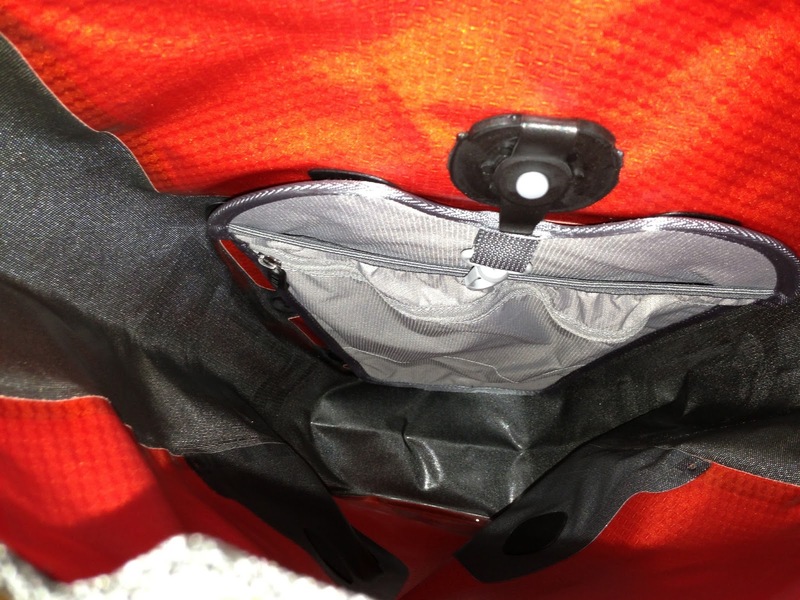 The bag is fastened by rolling the top opening over a couple of times and then fastening at the sides via the quick release buckle. It is a very simple but highly effective design. It is also a great deal quicker than using zips. 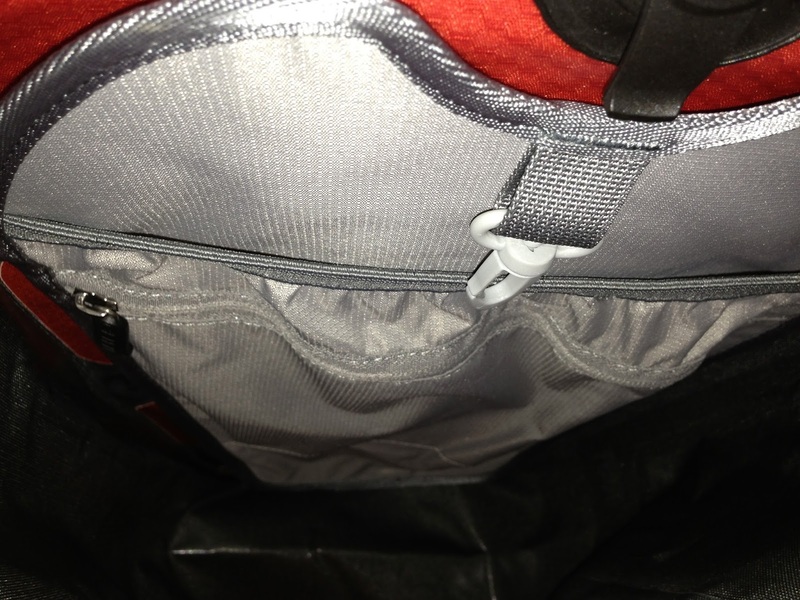 Inside there is a good sides pocket and a key clip. The addition of these is again testament to a well thought out design. You can if you wish add a hydration system to the Airflex via a waterproof rubber stopper - a good idea in case you want to use this backpack for that purpose in hotter weather perhaps. The all important question of performance. Well, on my commute home today I was caught in the rain that although not a total downpour was persistent. I had some important paper files, my iPhone, iPad as well as a few other items. I have to report that there was not a hint that rain had got anywhere inside. (In fact a work colleague has a larger version of this bag and told me that its contents survived being partially submerged in a lake when he was in a rowing boat and it briefly fell in). This bag isn't cheap but shopping around I was able to obtain a favourable discount. I have to say that it was worth every penny. The fact that it comes with a five year guarantee only serves to instil confidence. I recently sold the excellent Carradice Barley saddlebag and was toying with the idea of another type. I am glad that I took the plunge with this backpack. It isn't any heavier. It is comfortable to wear. I can carry more and have total confidence that whatever I place inside will remain totally dry. On Friday night / Saturday morning I will be cycling the 54 or so miles from London to Southend. I will still travel as light as I can but will definitely be taking my Ortlieb Airflex 11. With the plastic bag tax just around the corner and that certainly forcing a rethink on bicycle luggage a well made purchase O B man. 11 litres would be a challenge for me.